NOTE: All AM teams will play one challenge match in the PM. Teams may also have an officiating assignment! Admission for spectators is $15 for a two-day pass. One-day passes will only be sold on Sunday for $10. This allows spectators unlimited entry & exit during the event. Rosters will be frozen in AES as of January, 24, 2019. Any roster changes after this may be charged $10 per roster change at check-in. 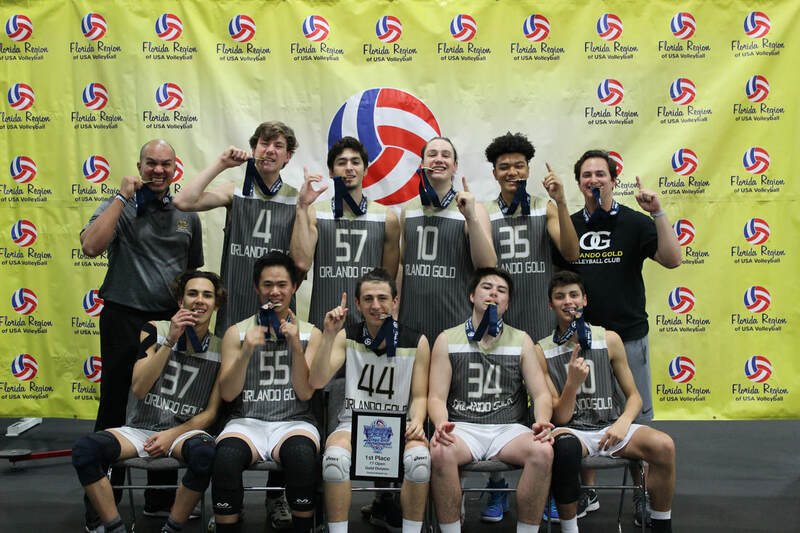 2018 Florida Fest Boys' Bid - 1st place gold division 2018 - Orlando Gold 17 Black ! Click the link below to see what college coaches will be attending the Florida Fest Boys' Bid Tournament! 1. Send ONE signed roster to be used as the official event roster. It may be AES or WebPoint. It may only contain (1) Head Coach, up to (2) Assistant Coaches, and (1) Chaperone. Rosters must be emailed to events@floridavolleyball.org by Thursday, January 24, 2019 at 5PM. Each coach/chaperone may only receive their own personal credential and cannot pick up other coaches/chaperones wristbands. Photo ID is required to pick up wristbands. Athletes may use their jerseys to enter the event. Once the signed roster has been submitted, rosters may not be changed.